Vashti Texas July 4th festivities. Don Quixote believed that the very essence of adventure was in “letting his horse take whatever path it chose...” So do I. 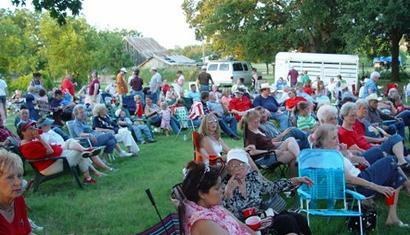 On July 2, 2005, I happend to be in Vashti, Texas for their annual fireworks. Mine is a metal steed, and my horse-feed is up to $2.11/gallon, so I didn’t want to wander too far. 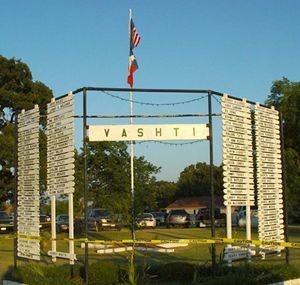 This afternoon, after meandering north and east, I ended up in Vashti, Tx, population 140 more or less. The first thing I noticed was dozens of cars parked along the road. An awful lot of cars for such a small town. The next thing I noticed is their town directory—the place is so small that they simply post the names of all the residents on a sign at the corner, with arrows pointing which way they live. I figured they were having their July 4th festivities, so I decided to check it out. A middle-aged fellow wearing a cowboy hat walked by as I stood there studying the town directory sign at the corner. He howdied, and when I asked about the activities he pointed toward a pavilion and said there were bands playing and a gospel group singing, and that I ought to go see. He was carrying a long narrow carry-all of some kind, I asked if he was a musician. He laughed and said, “I can’t carry a tune in a bucket. Two buckets!” The carry-all was a folding chair. I said that I think this town directory is a great idea. He said they used to have a store where you could ask for directions, but the store burned down and there was no place to ask for directions, so they put up the sign. I walked over to a covered pavilion, about the size of a small country church. The roof was corrugated metal, supported throughout by wood posts. Under the roof a small stage faced rows of wooden church pews and, behind the pews, tables and chairs. On the grass beyond the pavilion, hundreds of locals from Vashti and parts around sat in lawn chairs. An air-cushion moonwalk play area was filled with kids. 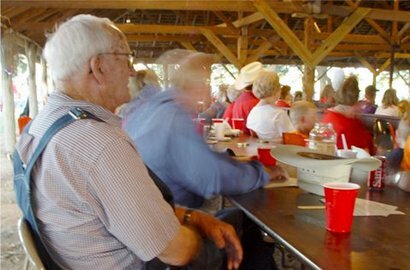 Several tables had coolers, cups and bottles. On stage, three stout young fellows were singing gospel songs, and doing so very well, in tight three-part harmony. Between songs, they talked about the imminent return of Jesus – September 11 was a sign – and the need for our nation to return to God. I stood just outside the pavilion listening for a few minutes, then turned to a fellow sitting a couple of feet away and said those boys sure sound good. He grinned and jumped up to shake my hand, like I’d just offered him a hundred dollar bill. “They sure do,” he said, and then said his name is Kenneth Liggett. “They’ve come out here the past three years.” I told Mr. Liggett that I saw several Liggetts on the sign on the corner. He was born and raised here in Vashti, and he said that whenever new people move here, they add their name to the sign. “It helps them feel like they belong here in Vashti,” he said. He pronounced it VAHSH-tie. I’m glad I heard him say it, because I would have said VASH-tee. What really impressed me about Mr. Liggett and the fellow I spoke to out by the corner, as well as everyone else I met later this evening, is their natural neighborliness. A few minutes later, I spotted a woman with a small girl in her lap. The woman was cooing and playing, and the child was giggling. I eased up to within a couple of feet, introduced myself and offered to take a pic. She said her name is Patricia Ralston, but she goes by Trisha. She is from Henrietta, but her sister and sister’s husband live here, and this child in her lap is Chloe, and over there is Chloe’s sister Daisy. They are Trisha’s nieces. And yes, you may take a pic. A few minutes later, I howdied and shook with a fellow named Larry Bailey, and when I mentioned that I am from Arlington and that I like to explore back-roads and small towns, he started rounding up people for me to meet. I didn't ask him to do that, it was just part of the neighboliness. He brought over his wife Patricia—“She’s in charge here,” said Mr. Bailey. “I just follow along behind her.” Larry and Patricia live in Denton, but he is from Forestburg and she was raised here in Vashti, in that house over there (he pointed), and he proposed to her at that building over there on the corner. He just pulled his car up in front of the place and proposed—that was 48 years ago. Then he brought me over to Juanita Denson, “the head mayor of the whole area”. Ms. Denson, a graying, grandmotherly woman, blushed, laughed and said that everyone calls her “Gee-maw”. She said that her biggest moment was 18 years ago when she was a big winner on Wheel of Fortune. I told her that she is the second winner of a nationally broadcast game show that I know—the other being my mother who won a radio game show in New York City in 1948. In turn, Ms. Denson went off to find her son David. She brought him over to meet me. Mr. Bailey spoke up and said that David is one of the biggest cattle dealers in these parts. And David’s grandfather, Lon Denson, was also a cattle dealer. Lon went around with a cattle trailer, buying from whoever wanted to sell—this was before they had a local auction. Mr. Bailey then guided me into a building that is sort of a combination community center, storage shed and museum. He pointed to photos on the wall, dating from 1906, showing a road crew, all locals pitching in to improve the road with their mules, horses, plows and other equipment. “Can you imagine trying to get people nowadays to form a road crew like that?” he asked, and I agreed that it would be unlikely to happen. He pointed out how big the mules were and said he didn’t think they breed them that big today. He told me about the equipment they used, including a type of shovel or post-hole digger pulled along by a mule. I didn't really understand what it was, but I was happy to learn about it anyway. I asked if any of the families in that photo are still in Vashti. He said yes, and pointed to each name and offered something about each family. He himself is kin to the Gills—Mr. Gill is one of the fellows pictured in the road crew. Next, he showed me a photo taken on the corner, clearly showing the community storm cellar which used to be behind where the community directory sign now stands. Then he showed me a framed copy of a list of Vashti residents—they didn’t have a phone book, so this list gave the name and house number of each resident, along with the year they moved to Vashti. Each house in Vashti is numbered, beginning with 1. So if someone lived in number 12, you simply walked down the street, counting houses until you reached 12. And yes, there was a town phone operator—a lady who worked out of her home, her switchboard was in her house, and she listened in on every call and knew where everyone was and what they were doing. If you needed to find someone, just ask the operator. All this I learned from Mr. Bailey. “We are a Biblical town,” he said with a grin that suggested he wasn’t to be taken seriously, as we walked out of the community building. “The name Vashti is found in the Bible. We have a Baptist Church over here—”, he pointed, “—and a Methodist Church over there. But no Church of Christ. You have to go into Henrietta if you need a Church of Christ. My wife and I are Church of Christ. My brother Ron graduated from Abilene Christian College in the 1940s.” Well now, since I'm an Abilene Christian ex myself, when anyone says they are connected to ACC or ACU, that leads to asking who we know. He asked if I knew the long ago music director, Leonard Burford. I said no, by the time I got there Jack Boyd was directing all that. I asked Larry if he might be kin to Pop Bailey in Abilene, the fellow who owned the house on Lincoln before my parents bought it. He said no, not that he knows of. 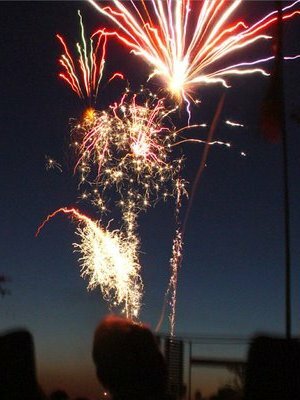 By this time, the sun had set, kids across the street were setting off strings of black cats and sparklers, and folks were moving their lawn chairs to a stretch of grass behind the community sign so they could watch the big fireworks show. The fireworks started with a sizzle, whoosh and bang—then rapid fire launches that looked like anti-aircraft artillery. There were bursts, flares, pops and a few duds—not too fancy but satisfyingly noisy and colorful. And after about fifteen minutes, a fellow hollered “That’s all folks!” And those folks gathered up their lawn chairs, blankets, coolers, cups and whatnot; and car lights came on as people got ready to leave. I thanked Mr. Bailey for guiding me around. He gave me his card. I headed home.